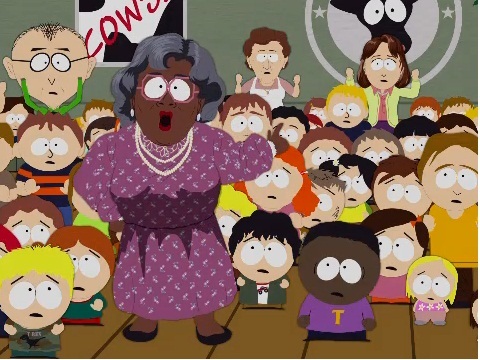 *South Park got its first chance to address the death of Osama bin Laden last night, and the creators – fresh off their leading 14 Tony Award nominations for Broadway’s “The Book of Mormon,” managed to blast Tyler Perry in the process. In Wednesday’s episode, Perry shows up to an award show at school to accept the Kathy Griffin Award (given annually to the celebrity most likely to show up). The jokes in his acceptance speech fall flat – except for one black boy in the audience who laughs, then quickly silences himself out of embarrassment. Angered that the school gave Germans as the “least funniest” award, the country creates Funnybot – a genetically-engineered machine that becomes the next big thing – angering real comedians in the process, including Tyler Perry. Dressed as Madea, he joins Adam Sandler, Louis CK, Conan O’Brien and others who hijack the school. At the end, the boys bury the worst thing ever to happen to comedy – and guess who that is? Yes, Madea is placed in a steel ball and buried under concrete, after which, President Obama is shown at a podium addressing the U.S. just as he did late Sunday night to announce the death of Osama bin Laden. Still can’t forget that Boondocks episode that parodied TP…It was viscious. Okay, so what exactly do they have against Tyler Perry? Doesn’t seem that funny to me. More like a sick obsession. This was a funny episode. They actually didn’t do Tyler that bad. I still laughed at the hellerrrrr. Oh lawd, wait til Tyler hears about this. He’ll likely tell Spark to go to hell.